Updated Saturday October 20, 2018 by Downtown Little League. Based in lower Manhattan in NYC, Downtown Little League's (DLL) fast pitch softball program is one of the premier softball programs in New York City and the State of New York. We follow official Little League softball rules and guidelines to ensure fast moving, fun and exciting games. We are proud of developing great girls who can not only compete athletically on the field but are great people and community minded citizens as well. Players are placed into divisions based on (1) their "Little League age" which is the player's age as of December 31st of the prior completed calendar year (before the upcoming Spring season) and (2) their skill level. Social rostering requests are taken into consideration in drafting teams for the minors and juniors minors division, but are not guaranteed. The Junior Minors Division is an Instructional Division for girls who are in Kindergarten through 2nd grade. A child must have turned 5 yrears old, by 12/31 preceeding the Spring season, in order to be eligible. Juniors Minors players participate in a combine on Fridays. On Saturdays, each team has a 1 hour hard stop game followed (or preceded) by a 1 hour team practice. The Minors Division is an Intermediate Division for girls Little League age 7 -11. The games are mainly kid pitch, and the players range in grades 2nd to 5th. Second grade girls who wish to play minors are expected to have 1 year of experience playing in Junior Minors Softball OR Junior Minors Baseball. Minors players participate in the Minors Combine Practice on Fridays at 4 PM. This is a practice for the entire Minors Softball Division as a group and is led by professional coaches. After the Combine Practice, the girls separate into a team practice. Games are typically on Friday nights or Saturdays. The Minors Season concludes with a Minors Division Playoff and Championship. Pitching distance is 35 feet. A regulation 11" ball is used. The Majors Division is a Competitive Division for girls who are Little League Age 9 -12. Majors players are generally in grades 5th to 7th. Advanced level offensive and defensive concepts are introduced. Practices are Friday nights. Games are mostly Saturday with some potential Sunday dates. The Majors Season concludes with a Majors Division Playoff and Championship. Pitching distance is 40 feet. Majors use a regulation 12” ball. The Juniors and Bigs divisions are Highly Competitive Divisions for ages 13-18. Players are 8th graders through High School Seniors. The skill-level of the players ranges from intermediate to advanced. The goal of the divisions is to prep all players for softball success at the High School varsity level and potentially college level. The Bigs division is the only division that operates with open registration, with no residency restrictions or limitations for signups. The players represent Downtown Little League in games against other leagues and teams in the 5 boroughs. Practices are Friday nights. Games are Saturday and or Sundays and will include travel within NYC. The season concludes with all city Inter-League Play-off and Championship. We form All Star Teams from our Minors, Majors and or Juniors divisions to represent Downtown Little League in the Little League World Series tournament. The teams compete to win in Little League Manhattan District 23, the New York Little League Section 5, the New York State Championship, the East Regional, and finally the World Series Championship. 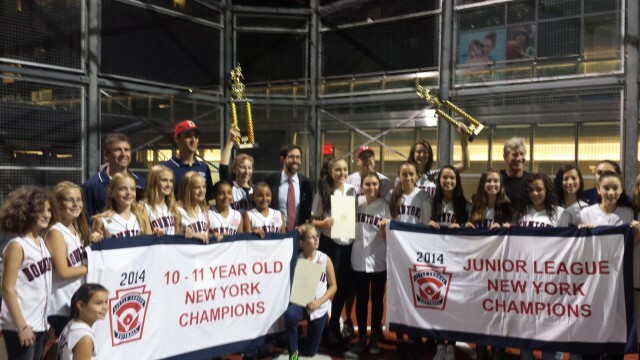 We have had recent success including winning New York State championships at the 14u and 11u age levels. There are plenty of opportunities to play softball in the summer & fall. Please follow the Facebook Page or feel free to inquire directly. Hitting and fielding clinics for DLL players, Sundays at Borough at Manhattan Community College gym. The program's success is all due to its volunteers. Aside from the outstanding parent volunteers, we've had alot of success with non-parent volunteers who work with our kids, including several who serve on our league's Board of Directors. We're always looking for new volunteer coaches, particularly those who with experience playing or coaching sports at the college level and beyond. We can help you find the right role with our various programs and teams depending on your schedule and availability. If you're interested in becoming a volunteer softball coach with DLL or discussing how you can help, please contact us by clicking here and we will get back to you. Thanks!